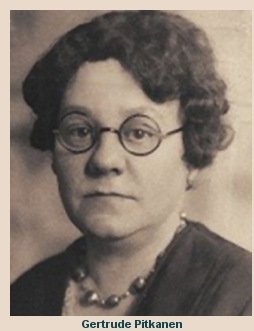 Gertrude Pitkanen was Butte's most notorious abortionist in the 1930s, 40s and 50s. She was charged three times with manslaughter or homicide following the death of women who had Gertrude Pitkanen"illegal operations," and each time charges were dropped due to insufficient evidence. Her reputation in the illicit sale of infants whom she delivered was less known. Seven of "Gertie's babies" born in the later 1940s and 50s have been identified. One of them, Mable Page, was told by a brother that her adoptive mother, Margaret Page, was involved in finding homes for only a quarter of those infants. Meaning Pitkanen might have sold at least 28 infants. There's no way of verifying where or how many other children actually were scattered throughout Montana – and beyond. Birth certificates signed by Pitkanen were automatically signed by health officers. Dr. William Antonioli, who still practices internal medicine in Butte, signed two of the Gallatin Valley birth certificates. His signature was virtually a formality, he said, and there was no concern then "nor is there today" about the attendant's credentials. The attendant merely testified that the child was born. Midwifery in those days often was practiced by women who were not formally trained, said Cyndy Kaiser, a Butte nurse-midwife. "Chiropractors were perhaps better trained for delivering babies," Antonioli noted. And Pitkanen supposedly was far better trained than most chiropractors, having begun her medical career as a surgical nurse. Chiropractors were not warmly accepted by the medical community 30 years ago, added Antonioli, who said he knew Pitkanen only by reputation. "Most of them were trained in Kansas, at a place that was widely reported to be a mill where they turned out skills on how to advertise, and the economic side." The profession since has become far more reputable, he pointed out. Pitkanen-manufactured birth certificates listed infants as the natural offspring of their adoptive parents, which would cause no questions among children who were unaware they were adopted. Those who did question their background, like the women from the Gallatin Valley and Texas, would find dead-end birth records signed by Pitkanen. Carl Rowan, owner of Gamer's Confectionary, remembers Pitkanen only by reputation. When the Gallatin women first introduced themselves to him, he replied, "You're Gertie's babies." Rowan said it was his impression that the majority of Pitkanen's clients at least for abortions, were prostitutes. Many of Butte's "soiled doves" traveled a circuit that included western states as far away as California, Rowan said, who would spend only a month or so in one location. So, if some of Gertie's babies were the children of Butte prostitutes, those mothers still living might have "retired" far from Montana. Two of the Gallatin Valley women were told that their mothers were the daughters of state politicians, apparently from out of town. This theory is feasible because Pitkanen is known to have performed abortions for women from Helena and Anaconda—with fatal results. Pitkanen was born in 1878 in Lincoln, Nebraska, and completed her nurse's training at Cook County Hospital in Chicago, according to her 1960 obituary. She later received a degree from the Palmer School of Chiropractic. She moved to Butte in 1907, and was one of the first surgical nurses at St. James Community Hospital, assisting her husband, Dr. Gustav Pitkanen—himself apparently no slouch in the abortion business. 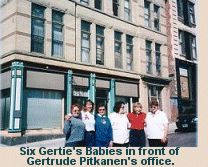 Much more is known about Gertrude Pitkanen as an abortionist than a baby-seller, largely because of research on the history of abortion in Montana about a decade ago by Diane Sands of Missoula, currently director of the Montana Women's Lobby. "Between 1900 and 1920," wrote Sands, "there seems to have been in Butte a high number of abortions that resulted in deaths, as compared with other Montana towns. Two well-known individuals were often involved in these early incidents: Dr. Gustavus Pitkanen and Dr. J.R.E. Sievers, a respected, upper-class doctor. Through the 1920s, little criminal action was taken in Butte against abortionists, who "were simply accepted and quietly condoned," according to Sands. Sands compiled a list of 23 Butte deaths between 1901 and 1917 attributed to botched abortions. Coroners' records linked three of them to Gustavus Pitkanen, though not as an indictment that he performed the abortions. Gertrude apparently took over the family practice before her husband's death in 1930 because she faced her first criminal charge in the Aug. 1, 1929 death of Violet Morse, a 23-year-old Anaconda school teacher. Interestingly, Dr. Sievers was one of the autopsy surgeons who testified that the woman was "suffering from an illegal operation," according to The Montana Standard account of a coroner's inquest requested by the woman's father. "A death certificate signed by Mrs. Pitkanen, as attending doctor, gave myocarditis, a heart condition, as the cause of death." On Aug. 28, Pitkanen was censured by the coroner's jury for signing a false death certificate and for failing to notify proper officials about the death. The allegation of death by an attempted abortion was substantiated by a Great Falls pathologist, but Pitkanen maintained that she was called to the woman's bedside after she had died. The jury concluded it could not be determined who performed the abortion. In 1931, Pitkanen married William VanOrden, who joined the Butte police department in 1908 and became a detective before his retirement in September 1929. On October 15, 1936, Pitkanen was charged with manslaughter on the October 13 death of Margie Fraser, 18, of Helena. An inquest determined that the woman had died in a Helena hospital from an illegal operation performed October. 1 in Butte. Eight witnesses included four physicians. Pitkanen pleaded innocent October 25 and posted $5,000 bond. On April 29, 1937, the case was dismissed because of "insufficient evidence and an inability to secure witnesses," the Standard reported. There followed a hearing before the sanity commission, which was ordered by her husband, William VanOrden. Pitkanen was in custody for several days before being declared sane. Pitkanen's final run-in with the law began May 30, 1939, when she was charged with murder in connection with the death of Mrs. Hilja Johnson, 37, of Butte, who died 10 days before "due to an incomplete illegal operation," The Standard wrote. At the inquest that preceded the charges, Pitkanen said Johnson had called at her office, and Pitkanen later visited Johnson at her home and advised her to go to a hospital. Charges were filed July 14, and a bench warrant issued for her arrest. But deputies were unable to locate her for more than a year. On July 20, 1940, she finally was arrested at her home near Columbia Gardens. Entering the courtroom in a wheelchair, she pleaded innocent to the charge, but was jailed in lieu of $5,000 bond. Sands found records at the Butte-Silver Bow Clerk and Recorder's office saying charges were dropped July 26, 1940. No newspaper accounts can be found on the subject. "It appears "that though there were isolated attempts to put a stop to Pitkanen's activity in Butte, authorities did not follow through to any definite convictions against her," Sands wrote. "It seems clear that Pitkanen's position in Butte was fairly secure, both from these recorded accounts and from the recollections of a couple of Butte residents." A Butte woman who was a student nurse at St. James Hospital in the early 1930s remembered the aftermath of some of Pitkanen's unsuccessful abortions. "I saw some of the people she treated—or mistreated,'" said the woman, who requested to be unnamed. "They died horrible deaths from infection. I saw three women die from it. They suffered terrible pain." The former nurse said Pitkanen's reputation as an abortionist was well-known throughout Butte, but she never knew that the chiropractor sold babies as well. A couple of people who knew Pitkanen remembered her kindly. Fritz Apostel, who did construction work on her houses during her latter years, recalled that she treated him and his workers nicely. "She was kind," he said. "There was nothing mean about her." Owen Smithers Jr., who, with his father, did portrait work for Pitkanen, also found nothing disparaging to say about the woman. Most condemning is one of Pitkanen's three surviving adopted daughters, two of whom live out of state. The daughter, who also wished to remain anonymous, said she was first a foster child before being adopted by Pitkanen. "I think she adopted us just for the publicity," she said. She said VanOrden was a likeable man, but he refused to raise the children or let them take the VanOrden name. The woman said Pitkanen punished them with beatings, and VanOrden would not come to their aid. "She (Pitkanen) was very different," she said diplomatically. "People told us that for the lives we led, we should have grown up to be criminals." She said VanOrden, a Spanish-American War veteran, was sick for most of his final years and spent a lot of time at the veterans hospital at Fort Harrison. He died April 14, 1951. The daughter recalled that Pitkanen lived comfortably, but probably spent quite a bit of money on medical bills for her husband. Pitkanen's health declined in the latter 1950s and she died April 19, 1960. According to the probate filed after her death, Pitkanen left an estate worth $26,991.72 to her adopted children, money to the Widow and Orphans Home in Eaton Rapids, Michigan, which was contested by a daughter, and about 58,000 shares of worthless stock. She also left a reputation that doesn't want to die.